Three more teenagers have been arrested on suspicion of murdering a 17-year-old boy who was stabbed in a street. 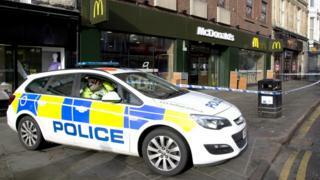 Liam Hunt was attacked in St George's Street in Northampton town centre at about 17:00 GMT on Tuesday. The people who have arrested are two boys aged 16 and 17, and a 19-year-old man. A 17-year-old boy arrested on suspicion of murder earlier remains in custody. A 15-year-old arrested at the same time has been released on bail. Northamptonshire Police said Liam Hunt died following a fatal stab wound. Ch Insp Lara Alexander-Lloyd said: "This is a tragic loss of a young life."